Super-cheap UV eraser 4w tube driver! Drives a 4 watt fluoro tube from 240v AC with minimum parts. All parts of this circuit operate at LETHAL VOLTAGES. Do not attempt to build this or open up a commercial product like I did unless you are totally competent and/or qualified to work on dangerous 240v AC mains equipment! 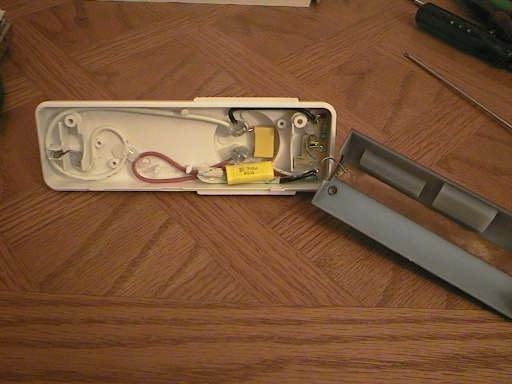 The ultra-violet light UVC tube as used in eprom erasers will make you go blind and can cause cancer to skin cells. You must not expose yourself to the UVC light, especially your eyes. This circuit is NOT my design, it is a review of the insides of a commercial 4 watt flourescent tube "night light" as sold in stores. This circuit is a very cheap way to light up a 4 watt fluorescent tube from 240v AC mains, and is totally suitable for a cheap home made UV eprom eraser. All you need is the 4w UV tube and a few dollars worth of parts, instead of paying $80+ USD for a commercial eprom eraser. 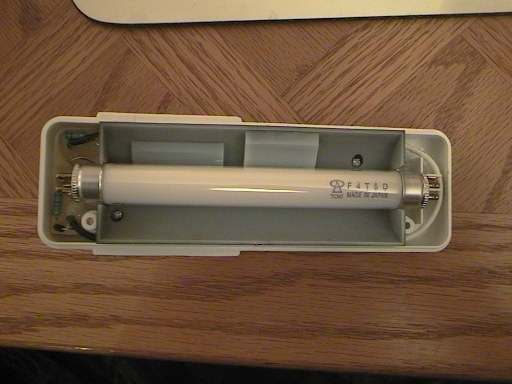 You could also buy a cheap 4 watt nightlight like I did and simply plug in the UV tube and put it in a box! C2 is used to limit the tube current once it is lit up and the tube resistance drops. R1 is required by law to discharge C2 when the device is turned off. C1 is required by law to reduce electrical noise from the device. (I believe) D1 and R2 provide some DC bias to help the tube initially light up. Copper foil strip is vital to get reliable tube start up (see photos). Even a "dead" tube will work as long as the gas is ok. This is because the circuit does NOT use the heater elements in the tube ends, (these elements usually fail first when a tube is dead). (I believe) the two 8-inch wire lengths (see photo) are required for noise suppression. Below are 3 photos of the inside of the commercial product. You can see the dull copper foil strip, and the yellow capacitors. The 2 resistors and one diode were on a tiny PCB, although with a circuit this simple a PCB is not really needed. To erase an eprom or PIC micro (UV erasable J PIC) you need ultra-violet light type "C" which is commonly called "UVC". 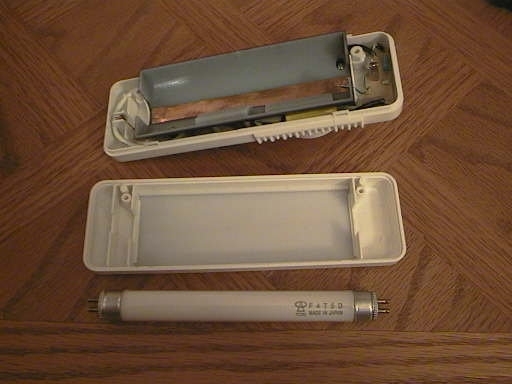 A normal 4w tube is type F4T5 (4 watt, 5 inch) and gives white light. This is shown in the photos and mine was marked "F4T5D". These are about $2 in stores. To erase eproms you CANNOT use the cheap "UV blacklight" tubes which are commonly available for use checking UV ink on documents and tickets etc. The only tube that works is the short wavelength UVC tube, which emits the dangerous light that causes materials to become unstable and makes humans go blind. This tube is sold for "germicidal" use and is used in medical sterilisation equipment to kill germs. Fortunately these hard to get UVC tubes are sold in hobby electronics stores as replacements for their eprom erasers. They are often expensive at about $18 USD but you will find cheaper prices if you shop around the net. The tube you need to erase chips is part G4T5 "Germicidal UVC" and has clear glass. If your UV tube has PURPLE glass it is NOT going to work for erasing chips. These tubes are visible UV (for checking UV stamps on money etc) and are a weak type of UV that is safer for humans. These tubes can be marked U4T5 or similar. Florian Voelzke posted this circuit from a German 4w night-light product, their mains voltage is 230v AC and the product uses the same F4T5 tube although some parts values are different to the product I have. Notice the German product has more noise filtering and more safety features than the cheap Asian night-light I bought. Richard Ottosen posted a circuit from a commercial LED traffic light, this is a curious light that runs directly from 120v AC mains, even though it is a semiconductor light using low-voltage LEDs. This is to allow it to be a complete plug-in replacement for the incandescent spotlights normally used in traffic lights. Very nifty, assuming the simple electronics don't fail, this solid-state light "bulb" should last just about forever. Also interesting is that the transformerless (capacitive reactance) supply uses a 6.8uF capacitor, this is the biggest i've seen and is a lot more current/power than normally used in capacitive reactance supplies. I'm not sure what the total voltage/current of the compound LED module is but I'm guessing about 150mA total.